We offer Official Certified Translation Services* for almost all languages and types of legal, official, personal, academic and business documents. 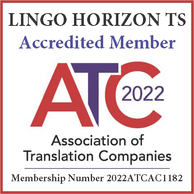 As a member of the ATC, our certified translation can be used for The Home Office, Passport Office, NARIC, DVLA, employers, courts, embassies, consulates, universities, banks, medical / teaching councils and many other organisations*. Get a Free Quote Now. Your document will be translated by a professional translator and a certificate of authenticity will be issued in English. The certificate will be on our headed paper, signed and stamped by us. The certificate will be attached to the translation together with a copy of the source document provided. All copies will be stamped. Usually the original copy of the document is not needed. Scanned copy sent by email is sufficient in most cases. * Please note that before we certify the translation, we send a draft by email to the client to check. This is necessary as sometimes the spelling of names is phonetic (Russian, Arabic, Chinese, etc.). We translate almost all languages from and into English. Free re-translation if you are not 100% satisfied. We work hard to provide some of the most competitive rates in the industry. Documents are fully translated and certified for official use in the UK or abroad*. Simply scan your document or take a clear photo then email it to us. All assignments will be treated as confidential. We offer comprehensive certified translation service, covering all types of documents. * Certification/legalisation requirements of different UK and foreign organisations may vary. We strongly recommend you to contact the organisation for which your translation is intended before purchasing translation service.